^ Wilder-Smith, A; Chen, LH; Massad, E; Wilson, ME (January 2009). “Threat of dengue to blood safety in dengue-endemic countries”. Emerging Infectious Diseases 15 (1): 8–11. doi:10.3201/eid1501.071097. PMC 2660677. PMID 19116042. http://www.cdc.gov/eid/content/15/1/8.htm. ^ Teo, D; Ng, LC; Lam, S (April 2009). 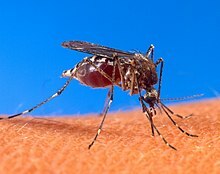 “Is dengue a threat to the blood supply?”. Transfusion Medicine 19 (2): 66–77. doi:10.1111/j.1365-3148.2009.00916.x. PMC 2713854. PMID 19392949. http://onlinelibrary.wiley.com/doi/10.1111/j.1365-3148.2009.00916.x/full. ^ a b c d e Martina, BE; Koraka, P; Osterhaus, AD (October 2009). “Dengue virus pathogenesis: an integrated view”. Clinical Microbiology Reviews 22 (4): 564–81. doi:10.1128/CMR.00035-09. PMC 2772360. PMID 19822889. http://cmr.asm.org/cgi/content/full/22/4/564. ^ a b c d Gubler, DJ (July 1998). “Dengue and dengue hemorrhagic fever”. Clinical Microbiological Reviews 11 (3): 480–96. PMC 88892. PMID 9665979. http://cmr.asm.org/cgi/content/full/11/3/480. ^ a b Henchal, EA; Putnak, JR (October 1990). “The dengue viruses”. Clinical Microbiology Reviews 3 (4): 376–96. doi:10.1128/CMR.3.4.376. PMC 358169. PMID 2224837. http://cmr.asm.org/cgi/reprint/3/4/376. ^ a b Sampath, A; Padmanabhan, R (January 2009). “Molecular targets for flavivirus drug discovery”. Antiviral Ressearch 81 (1): 6–15. doi:10.1016/j.antiviral.2008.08.004. PMC 2647018. PMID 18796313. https://www.ncbi.nlm.nih.gov/pmc/articles/PMC2647018/.